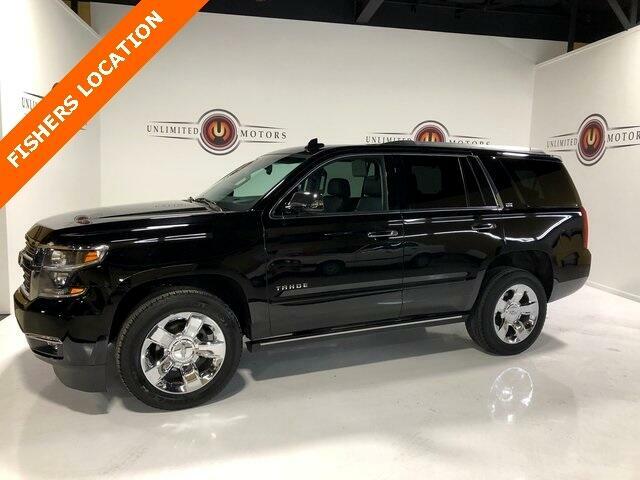 Navigation, Bluetooth, Back Up Camera, Entertainment, Sun/Moon Roof, 3rd Row, Towing, Luggage Rack, Heated Seats, Tahoe LTZ, 4D Sport Utility, 4WD, 3rd Row 60/40 Power Fold Split-Bench, 5 12-Volt Auxiliary Power Outlets, ABS brakes, Auto-Dimming Inside Rear-View Mirror, Body Security Content Theft Protection Package, Bose Centerpoint Premium 10-Speaker Surround Sound, Compass, Driver Inboard & Front Passenger Airbags, Electronic Stability Control, Emergency communication system, Floor Console, Fog Lamps, Forward Collision Alert, Front & Rear Parking Assist, Front dual zone A/C, Front Heated Reclining Bucket Seats, Hands Free Power Liftgate, Heated & Cooled Driver & Front Passenger Seats, Heated 2nd Row Seats, Heated door mirrors, Heated front seats, Heated Leather Wrapped Steering Wheel, Heated rear seats, Heated steering wheel, Heavy-Duty Rear Locking Differential, Illuminated entry, Keyless Start Switch, Lane Departure Warning & Safety Alert Seat, Low tire pressure warning, Memory Settings, Navigation System, Passive Entry System, Perforated Leather-Appointed Seat Trim, Power Adjustable Pedals, Power Liftgate, Power Release 2nd Row Bucket Seats, Power Sunroof, Power Tilt & Telescoping Steering Column, Power-Folding Heated Outside Mirrors, Preferred Equipment Group 1LZ, Premium audio system: Chevrolet MyLink, Rear Cross-Traffic Alert, Rear Seat Blu-Ray/DVD Entertainment System, Rear Seat DVD Entertainment System, Remote Keyless Entry, Remote keyless entry, Side Blind Zone Alert w/Lane Change Alert, Steering wheel mounted audio controls, Sun, Entertainment & Destinations Package, Theft-Deterrent Alarm System, Traction control, Universal Home Remote, Vehicle Inclination Sensor, Vehicle Interior Movement Sensor, Wheels: 20" x 9" Chrome, Wireless Charging. CARFAX One-Owner. Odometer is 3601 miles below market average! Priced below KBB Fair Purchase Price!